Hyundai unveils Kona Eletric SUV. April. 13, 2018 08:01. by Eun-Taek Lee nabi@donga.com. The Kona, Hyundai Motor Co.’s second electric vehicle (EV) model, has become a hit product, as the company has garnered preorders equivalent to its 18 months’ production capacity in just one month. Experts project that this year will likely be the start of EV competition as various models that can run over 400 kilometers in a single charge. At the EV Trend Korea 2018 fair held at the COEX exhibition hall in southern Seoul on Thursday, some 40 domestic and foreign carmakers, including Hyundai, Renault Samsung Motors, Jaguar and Tesla, and autoparts makers showed off their EV technology. Hyundai’s Kona Electric received the spotlight, as it was the first time the model was unveiled in Korea. The car is the world’s first electric compact sport utility vehicle (SUV). Hyundai appears to be on track in addressing one of the biggest issues involving electric cars – their short travel distance. Fully charged, a Kona Electric with a 64-kWh battery can travel 406 kilometers, capable of making a one-way trip to the southern port city of Busan from Seoul without an additional charge. The model is equipped with a motor with up to 204 horse power and a maximum torque of 40.3 kilograms per meter. The battery is one of the most expensive components of an electric vehicle. The more batteries an EV has, the higher its price will go. The Kona Electric is available in two battery capacities -- 64kWh and 39.2kWh. The Light Package model mounted with the 39.2kWh battery is designed for consumers who main use their cars for driving in cities or commuting. Fully charged, it can run 254 kilometers but is 3.5 million won (3,265 U.S. dollars) cheaper than the 64kWh version. It takes 9 hours and 35 minutes to fully charge the larger battery but just 54 minutes to charge it to 80 percent. Hyundai aimed to sell 12,000 units of the Kona Electric this year but has already received preorders of more than 18,000 units. 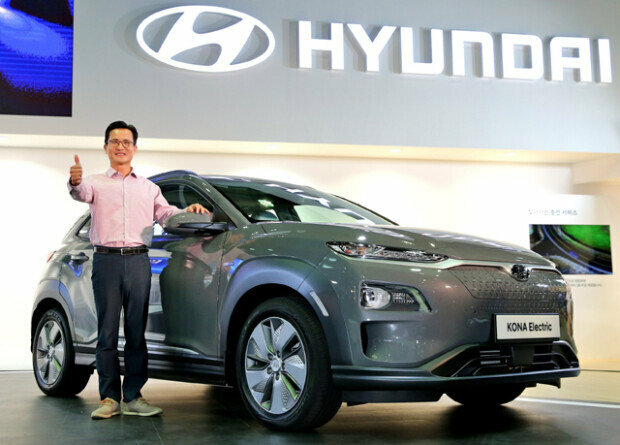 The Kona Electric is manufactured at Hyundai’s plant in Ulsan which has an annual capacity of churning out 12,000 units. A Hyundai official said that the company had to halt receiving more preorders due to the heavy demand. The 64kWh model has a sticker price of between 46.5 million won (43,377 dollars) and 48.5 million won (45,242 dollars), but those prices go down to 29.5 to 31.5 million won (27,518 to 29,384 dollars) in Seoul thanks to government subsidies. British brand Jaguar also unveiled its electric SUV I-Pace in Korea. Claiming to be a five-seat luxury SUV, the I-Pace is equipped with a 90kWh battery and capable of traveling 480 kilometers per a single charge. The vehicle also boasts up to 400 horse powers and can reach the speed of 100 kilometers per hour in 4.8 seconds. As an increasing number of EVs feature longer travel distances and enhanced power, the Korean EV market is expected to grow in earnest this year. According to the Ministry of Land, Infrastructure and Transport and the Korea Electric Power Corp., a total of 29,310 electric cars are registered as of March this year, up from 338 in 2011.